Thinking of Selling? Sellers have read that home prices are up and interest rates are low, so they’re curious if it would make sense to consider a move right now. Many have been trapped in their home for so long they forgot what it was like to have options. They want to take advantage of low interest rates but many are not sure they have enough equity to make a move. The whole process can seem daunting. 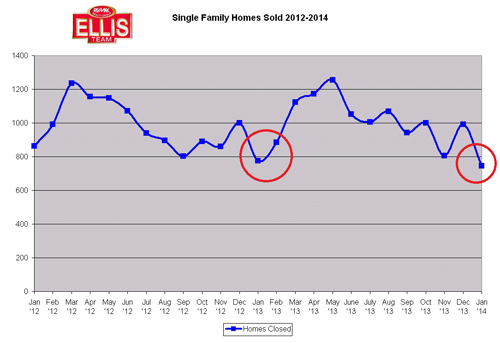 For years the Ellis Team has played with several online valuation models to help curious homeowners out. We’re excellent at counseling sellers and going over options, but many don’t even want to waste our time until they get a sense that they can do this. The online valuation models were all over the place until now. No online valuation will ever take the place of what we do; how could it? The computer has never been inside your home or the homes it’s using as a basis to compare yours to. It’s just a computer. We have found one that does a decent job though. 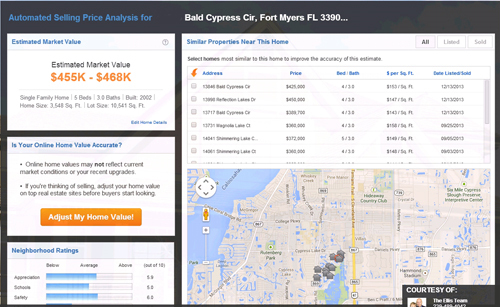 If you’re considering selling simply go to www.swfloridahomevalues.com In just a few easy steps it asks for your property address, brings up an aerial view of your home and asks you to verify if it has the home size, bedrooms, and bathrooms correct in the database, and voila’ it sends you a beautiful automated selling price analysis for your home complete with a map of comparable sales, a list of comparable sales along with their selling price, date sold, price per sq ft, and more. 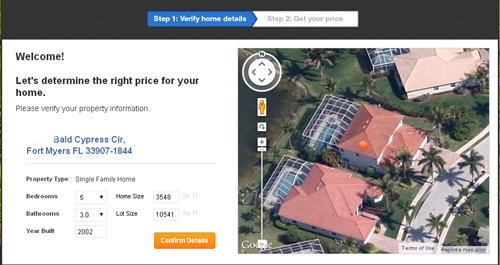 It also provides neighborhood ratings and will email you instant alerts on changes to your home’s value. It’s free to use and very helpful. All we ask is that if you decide to sell now or in the future, you at least give us a shot and see what we can do for you when you’re interviewing agents. We’re experts at guiding you through the home selling maze. We understand many pieces of the puzzle have to fall into place and many times we can offer suggestions to help you. We’ve helped thousands of homeowners through this process so we’ve gained some experience along the way that can really help you make better decisions. Most people don’t realize that their Home Equity Line of Credit (HELOC) could be facing some stiff payment increases in the coming years. If you bought a home in the 2000’s chances are your lender discussed adding on an interest only line of credit to your first mortgage in case you needed money in the future. Some people used the line of credit from the get-go to avoid paying PMI insurance. It was an attractive option as it was probably interest only and the payment was affordable. Many are as low as 3.25% Rates are still that low today but the rates can go up at anytime, but that’s not what has the banking industry worried. The part that wasn’t fully explained to consumers is that the interest only portion lasts for the first 10 years. After that, the borrower must begin making principal and interest payments, which will add money to your monthly payment even if rates don’t rise. But here’s the kicker. The new payment is amortized over 15 years, not 30 years, so essentially you have to pay back the entire HELOC over 15 years in addition to your 1st mortgage. Let’s say you have a 1st mortgage and a $200,000 interest only HELOC. At 3.25% the HELOC monthly payment is $541.67. With the new amortization that payment increases to $1,405.34 If it was based upon a 30yr amortization the payment would be $870.41, still a substantial increase. Unfortunately it’s not, so get ready to pay a lot more. 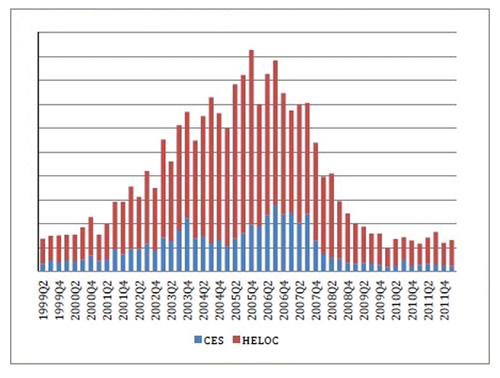 You can see from the chart when the HELOC originations started jumping. Many SW Florida homeowners are up against this reset now and many more will be hearing about this subject in the next few years. It is a shock when you’re not expecting, but homeowners who act now have a chance to do something about it. You can start making the extra payments voluntarily now which will reduce the principal when your loan does reset. This also gets you used to the higher payments and allows you to budget properly. For some this will not be feasible. If you have equity now and good credit you might look at refinancing both loans into one mortgage. It’s much harder to get a loan today than it was 10 years ago, but if you can that may be a great option. If you cannot refinance, you may want to look at selling now, especially if you have equity. It would be a shame to come up against the deadline and be forced into delinquency because you can’t afford the higher payments if you have equity. If you are upside down on your mortgage, you can either start talking with your lender now or look at doing a short sale. Nobody wants to go into foreclosure. Many have resisted a short sale up until now, but a short sale is much better on your credit than a looming foreclosure would be. We’re not here to tell you what you should do. That’s a personal decision and maybe one to be discussed with your attorney or accountant. We are here to educate you on what’s coming and tell you about your options. If you think you may want or need to sell, please give us a call. We’re experts at looking at the situation and listening. We’ll get you top dollar for your home and help you move on. So many people have been locked into their homes waiting for the market to rise, and it has. Perhaps the market has risen enough for you to sell now. Perhaps it makes sense to down size, upgrade, and move to another location, etc. We can help. Give us a call at 239-489-4042 If you’d like to search the MLS first, go to www.Topagent.com and you can see what homes like yours are selling for. Of course there’s no substitute for meeting with us and us evaluating your home. We look forward to working with you to sell your home, or to buy one. Last week I had the pleasure of presenting the residential market outlook to the CCIM (Certified Commercial Investment Member) Real Estate Outlook Conference. This conference is comprised of the Top commercial specialists in Charlotte, Lee, and CollierCounties along with community leaders like Mayor Randy Henderson of Fort Myers, Jim Nathan president of Lee Memorial Health System, a VP from Hertz, and Wilson Bradshaw president of FGCU among others. The commercial market lags the residential market. Residential went down before commercial did and therefore came out sooner. 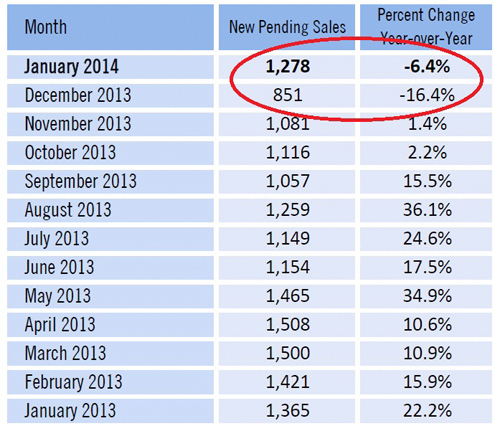 CCIM experts were happy to report commercial is again on the rebound. 2013 was a very good year for residential which bodes well for commercial going forward. Nationwide housing prices rebounded in December quite nicely over the previous year. 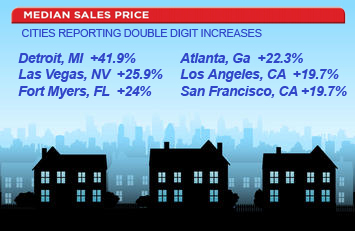 Detroit saw the largest increase in the RE/MAX national housing report followed by Las Vegas. 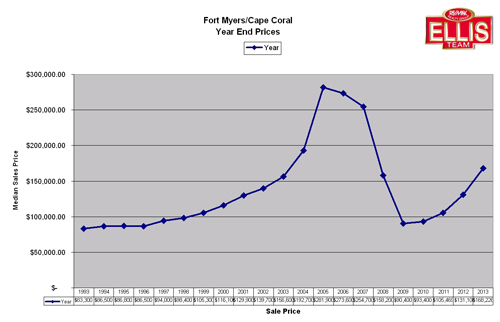 Fort Myers came in with a 24% median price increase in December, and for the year Lee County saw a 28.31% gain over 2012 numbers. In December there were reports nationwide of a slowdown in home sales but many states have reported this may have been a weather related issue as treacherous weather has wreaked havoc on airlines, schools, and businesses up North this year. The North’s bad weather could be SW Florida’s good fortune as we have seen in years past bad weather up North leading to more home sales down here. In fact, yesterday I heard Carnival cruise lines announced they sold more cruises in January than any other month in history. With blizzard conditions this week and forecast conditions again next week, this might be the last year for some suffering through this weather. Lee County is working on bringing more companies to SW Florida, and with record breaking bad weather, maybe we’ll attract entire companies rather than just disgruntled homeowners looking to make a change. This would be huge as we’d be adding jobs to the area to go along with increased residents. While the SW Florida real estate market may not see 28% price gains this year, 2014 looks to be on track to be another great year. If another company or two like Hertz or Gartner decides to relocate here it could turn into a fantastic year. We’ll be keeping our eye on several wild cards which could affect our market. Weather up North is one of them, along with the national housing market, interest rates, the overall economy, consumer confidence, business hiring and unemployment, and company relocations. Realistic sellers have an excellent chance to sell their home right now. We have seen some over-pricing occurring in this market and we’re watching these listings sit on the market. A Seller’s market is an excellent time to sell but not a license to over-price. Over-priced homes do not sell. Believe it or not, back in 2005 and 2006 many sellers failed to sell because they were greedy and missed an opportunity. Oh my, would they love to have those days back!